iCCup — this is joke or what? Landscape has been heavily tested by the top players (B+, A+, etc) after the first few games we had only positive feedback. From strategic point of view included. Updated map have more variety, open for more possibilities for skilled players to shine. Most complaints that we are getting are coming back to the cosmetics, and the Minimap changes. Camera angle has not been touched at all. If there is an issue, please give some screenshots, im interested to see what is going on there. And the mechanics, we had to spend more then a year just fixing what was broken at IceFrog's version. Just to name a few, try play Huskar with Helm of the Dominator and fire arrows on or use a Manta style on a Dragon Knight while ultimate is active... and dont event get me started on ORBs. Current version is more stable and balanced than ever. Anyway, we are open to suggestions, let's make it work for everybody. I have to question multiple things in this post. 1) how come when i am playing with aza/baltazar/eldos./judostyle/legendsofpain they are all playing 6.83? Going from your post, all of the top A players (and i know quite a lot of them) should happily be playing the new version since it is "obviously" superior. What exactly is the benefit for the "dota" map as a whole to reduce the skill threshhold for players? Again, gather your suggestions as Ant stated, provide them and discuss about the same because quality is everyone's responsibility. And always stay true to yourself, yet always be open to learn. It has been stated that the major of the players experience lags and drags in 6.83. Let's start with this issue. As for the other platforms which _7777777 is calling for - yeah right. Trust me I've checked them mostly all but somehow I've "forgotten" my login details. Here on the other hand, I'm exactly 9 years and still kickin'. Why? Because there is always something new, new challenges, new players and personally, from my experience there is nothing more to wish for. All right, but since that times, that you had tested them, the many changes has happen. Maps and platforms was making a big step ahead. Iccup, on the other hand, last one-two years goes it's own slow way, with low skill developers. Here's a lots of beautiful changes which will never happens with the iccup, unfortunately. After all, ok, go continue do your job, you do it well at your own skill level, but it far from best at all. Good luck. First of all, thank you moders for creating something new with huge improvements. I believe it was a hard and demanding task to do, but from what I can see - you've made an outstanding job. A ton of effort, work and avoided obstacles. It simply must be a subject of appreciation. Yes-yes, stop, we do not say that they didn`t do anything and appreciate their efforts, but do we really need to worship them? You see the map. You see community reaction. Community does not say that they are worth nothing or even less. Community wants to see new things (the major part). But nevertheless we do not want to see suspicious and doubtful changes that are made in order to (...why? can you explain? why on the earth? what the hell? what the delirium of the inflamed mind? how can it be?) instead of official changes in compliant patch. I understand that the patch is in dota2, but who cares? Why was it decided to do this gag? On the other hand I struggle to understand stated facts regarding new version but I'm pretty much unsuccessful with it. Changes have been called for by a lot of players. And finally we have a map with new items (items which are basically a source of new strategies and tactics). Slightly noticed map change, environmental surroundings etc. You guys are mentioning tactics? Every bloody game so far, we have seen same and same item builds, picks, ward placement spots and so on. Creativity = 0, tactics = 0, in general, at least for me, it was so boring that I would play the worst possible game ever created - pubg. Personally I don't see any fun in repeated item builds and repeated picks. It is like waking up every morning and doing absolutely the same thing over and over again. Boring and pointless. New map - ahhh, ok. New items - good. I adore them. New landscape and some wicky (or tricky?) economy - what is it? wtf? where do you see it? In Idota (or iccdota in other words)? To be continued due to post limit. Give it a chance, play it. If you don't prefer it - play older version. Every platform has plans for sustainability, so does iCCup - I assume. In other words, that would be continuous improvement. And of course, feedback from players is very much important and appreciated as Ant stated. But please, try to do it in an orderly manner. This is someone's work for crying out loud. It is still Dota 1 not Dota 2. Dota 2 is a ruined game and completely unattractive. It`s funny. Really. I personnally played. Issue is that the majority of bots (laggy, delayed or even working with endless reconnects or disconnects are preserved for classic (for old map if you doesn`t understand), umm - so good, what do you think, is it fair?) is dedicated to "new shittyny map" (c). I appreciate their work, but repeatedly must state - if work was perfect, do you really think that majority would cry, whine and aggressively scold the map? I think the reality judges like me - and players are not such a dicks. And what do you think? For example, if the amount of work was huge and the result is crap decorated with brilliants, will you admire workers? Answer plz, I`m interested. I'm wondering, what will you guys do when Reforged comes out? Will it also be a subject for critics (e.g. 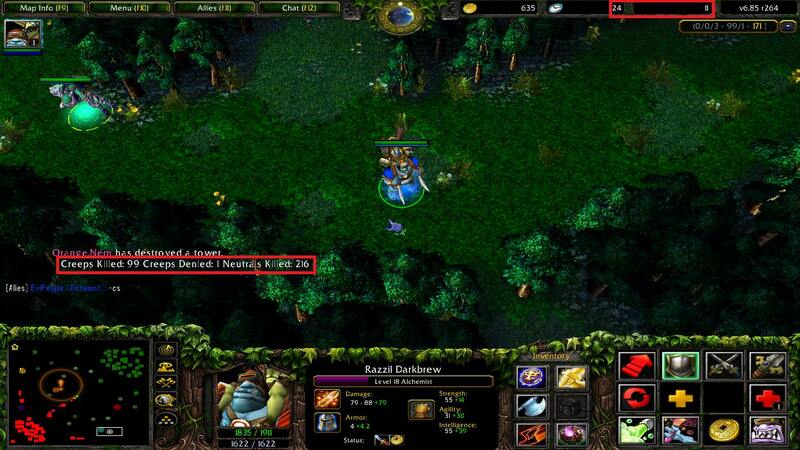 this is dota 2 graphics?). I think not :) But again, it is a part of (B)lizzard's sustainability. For example, why are you playing cod black ops 4 or cs:go? Why not cod4 and cs 1.6? Eventually older games have their end. Point is - new improvements - new tactics - new and improved player skill - a lot of fun. As for the other platforms which _7777777 is calling for - yeah right. Trust me I've checked them mostly all but somehow I've "forgotten" my login details. Here on the other hand, I'm exactly 9 years and still kickin'. Why? Because there is always something new, new challenges, new players and personally, from my experience there is nothing more to wish for.Again, gather your suggestions as Ant stated, provide them and discuss about the same because quality is everyone's responsibility. And always stay true to yourself, yet always be open to learn. Yes yes, you seem be sane. But see the blizzard forums and ask yourself why the hell they regret to use hostbots and ban them. I want to state to you repeatedly, that many sane offers and suggestions are just ignored. Why do we need to repeat the cycle, if the result is ignoring us??? WHY? Idota (or iccdota in other words)? Или перевести 200 страниц нашего обсуждения сюда? I'm just saying to give this map a chance. Of course it can't be balanced or perfect at the beginning but what we players are here for. To provide them some feedback. Not a single game around the globe didn't managed to exist without community. I'm just saying to give this map a chance. Nobody is against the new map. The total piss-off is the result of host-bot redistribution, giving lags for native 83 players. And the feedbacks are regularly ignored due [email protected] iccup excuses [email protected] We have already mentioned landscape ("we know better" thing, yep) and economy (yes, it received some corrections, but at first reaction was - it`s correct, users are wrong). See the thread of discussion of map and seek there posts, mentioning work with bugtracker. You`ll be pleased with fast and professional... excuses, saying, why the bug is featureor why it can not be fixed. How do you like this, Elon Musk? Try to do it. Googol trans?